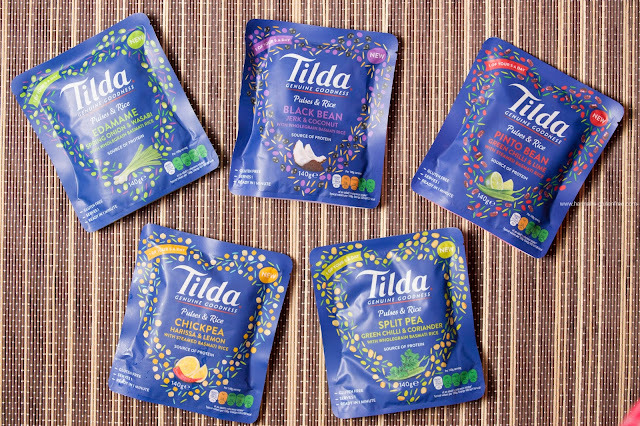 A little haul for today, I have been sent some of the new Tilda Pulses and Rice Pouches so I thought I would show you what I got! This is not a tasting blog post, so I am not sure what I think of them yet, I'm just letting you know what's around! The whole range is of course gluten free, dairy free and one of your five a day, so already sounds pretty amazing. These are single serve pouches but I am sure if you are using them as a side with some salad and meat, you could make this stretch to two people, but are still great for those who live alone or just eat different meals to the family! The pouches retail at £1.39 and can be found in Ocado, Tesco, Asda and Sainsburys. This is meant to be very Moroccan in flavour and contains chickpeas, basmati, rose harissa, Dukkah spices, spinach and lemon. It is suggested that this flavour would pair well with hummus and salad or even with roast lamb. James loves lamb roasted so we may have to try this! This one sounds a bit spicy. Inspired by Mexico this rice mix contains pinto beans, back turtle beans, basmati, avocado, lime, paprika, pumpkin seeds and chilli. I think this is calling to be used in a burrito, aslong as it's not too hot! Containing black eyed beans, black beans, wholegrain basmati, coconut, sweet potato, jerk seasoning, garlic and ginger. I feel his super flavoursome combination needs something much plainer to accompany it, so I would think either grilled chicken or turkey would suit this well! We have hit the Japanese flavouring here, with chives, spinach, miring and lemon, I feel that this rice will be very fresh compared to the others. It is suggested to serve with prawns or salmon in a Teriyaki sauce, but I think it would also be great with some crispy roasted duck, to add freshness to a rich dish. With yellow split peas, mung beans, basmati, green chilli and coriander, this very indian inspired rice I think would be beautiful with a chicken tikka pieces with some mint yoghurt for dipping to add some sauce. I would love to know what you think of the flavourings of this new range. I love how they are all inspired by different cultures, yet the basmati is a constant within it all, it truly shows how versatile rice is!